I recently had the rare opportunity and distinct privilege to spend a day with a small group of Q’ero shamans at an event hosted by the Institute of Noetic Sciences and made possible by the Four Winds Society. The day-long event consisted of two participatory ceremonies, and some Q&A time. 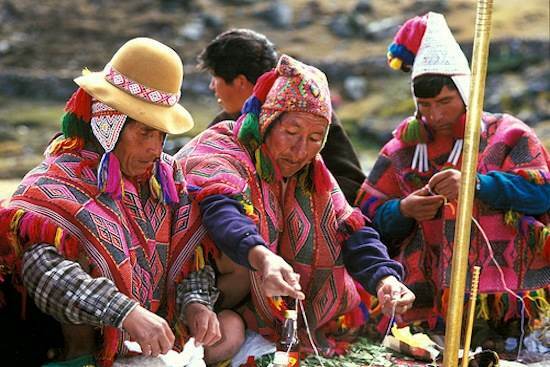 Briefly, the first ceremony was a despacho, a ceremony which is a giving back, a gift to the Pachamama. It is an opportunity to offer our prayers and intention for ourselves and the world. Ultimately, the despacho establishes a right relationship (ayni) with the Pachamama and with ourselves through an alignment of our three centers: our sources of action, love (munay), and our wisdom. In the second ceremony we were initiated in the rite of the Divine Feminine, called “Pampamesayok” by the Q'ero. This rite awakens an appreciation and awareness of the feminine gifts (i.e. the gift of nurturing) within each one of us, as both male and female individuals. The co-hosts, who had traveled with these shamans across the world and for many months, relayed to us that never once did the shamans complain about anything, never once did they act with any less energy or lack of compassion. Every interaction and every ceremony carried with it an unyielding presence of love. Shortly before these remarks, the audience had made a request of the main shaman for a group blessing. Instead of beckoning to all of us as a whole, he picked up his mesa (bundle of sacred stones) and went to each individual in the crowded auditorium, squeezing through chairs to personally bless everyone in that room, upwards of sixty people. And the best part of it was that he did so with the biggest grin on his face, as if amused at our grateful astonishment. After all, this was munay, this was love, this was what he is and what he lives. From the handmade clothes that they were wearing, in which every color and every line carries a sacred symbolism, to the motions of each ritual, and the twinkle in their eye, their spiritual energy is something that is lived in every moment and in every interaction. Before we started any of the events on the itinerary, the shamans made sure to ask permission from the local spirits, their sacred mountains and The Pachamama to perform the upcoming ceremonies in this space. Together, we all stood for a moment in each of the four cardinal directions, then touched the ground, and lastly reached up towards the sky, while the elder shaman led us in a ritual call for permission. This was both humbling and deeply grounding, humbling in its simplicity and grounding in its power. To be so connected at all times to the living space around us is something entirely alien to a modern way of life. So pausing and taking a moment for respect and reconnection awakened that lived awareness and reverence within us, a gentle reminder of the sacredness of space. Throughout the day, it was made clear that we were not “given” anything in the ceremony or initiation rights. Instead what was already within us was awakened. For example, the catalyzation of our feminine reinvigorated the universal ability in the individual to be a nurturing soul and to bring the world into a more harmonious, healthy balance. Reawakening this internal knowing brings forth a fuller sense of self and a refined capacity for a lived awareness of sacred space, for filling every act and every moment with spiritual, loving energy, and for an enduring, conscious, compassionate relationship with ourselves, each other, and The Pachamama. For a soul-stirring rediscovery of your inner knowledge, join us on a fully immersive journey into indigenous culture. Learn how to open sacred space in your own life. Find out more about shamanic training opportunities via the Four Winds Society. Discover other experiential workshops and the wide array of research studies conducted by the Institute of Noetic Sciences.